Below explore one-of-a-kind, handcrafted stained glass of original designs. Also available are custom designed glass windows. Read below how to make your designs come to life in stained glass. 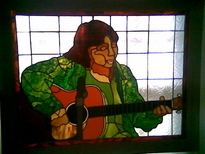 Contact Ilene Richardson, Fine Artist to create a stained glass window for you or someone you love. Just send an email and begin the exciting journey of having an original stained glass window created for you or a loved one. Custom designs in stained glass are arranged by appointment, begin with a private consulataion by email, phone, webcame or in your home or office if you live near the Eastern Shore of Virginia. HOW TO BEGIN YOUR CUSTOM STAINED GLASS WINDOW will be with a private consultation by email, phone, webcam or in your home or office. Ideas, colors and designs are explored until the perfect window can begin. Sometimes a second consultation takes place. Sketches are created and special stained glass software is used to draw the window and prepare for its creation. Deciding to have a stained glass window created just for you can be a very exciting experience and your life will be enriched when you own a custom designed stained glass window. Lets discuss your stained glass window, email me anytime to ask questions or so we can begin planning a window for you! Working with stained glass for over three decades has been a wonderful experience as an artist and glass continues to enrich my life and more importantly, the lives of others. * New to my glass studio has been stained glass windows created for people of their “member of their family” otherwise known as their dog or other pet. This glass journey all started while creating my own personal window of my dog, Daisy who was a doberman and rottweiler mix dog that I was fortunate to have in my life. When I was working on the drawing for the window and finally printed it out in color, this picture stopped me in my tracks and touched my heart, as if she was right in front of me again! It was an emotional moment more powerful than I ever expected. I knew right at that moment the artwork I had to offer Pet Portraits in Stained Glass to animal lovers everywhere.